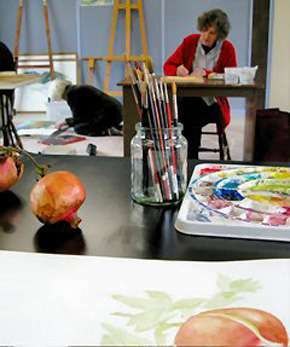 The Art Group meets each Thursday 1.30 – 4.30pm at the Steels Creek Community Centre. Bring your paints/pencils/pastels, discuss your art and share skills. A second group, started by Malcolm Calder in 2014, runs on Mondays 1.30 – 4.30 pm. No experience is necessary, but bookings are required. Note: Thursday group will continue meeting over the holidays, except for 24 & 31 December, and days of Total Fire Ban. The Monday group will re-commence on 8 February 2016.